SID, Serbia – Aliah*, a 28-year-old woman from Afghanistan, took an unusually brave step in April: She spoke with candour about her sexual and reproductive health needs at a workshop in Sid, a town in north-western Serbia. “I am happy that we have a gynaecologist available,” she explained. Serbia is hosting thousands of refugees, migrants and asylum-seekers, mostly from Iraq, Afghanistan and Syria. The workshop, held in a transit centre, aimed to inform them about available sexual and reproductive health care, including gynaecological exams, antenatal care and family planning services. The workshop also sought to understand the obstacles to care that refugees and migrants face. Women like Aliah, who is originally from Kabul, demonstrate why these services are important: She has three children and has had two miscarriages. She gave birth to her first child at home, with the help of an elderly woman from her village. Now pregnant with her fourth child, Aliah is relieved to know that she can access medical care. “I am very glad… that I have an opportunity to take care of my body and to increase my quality of life,” she said. UNFPA, together with its partner the Danish Refugee Council, is making sexual and reproductive health care available to refugees and migrants around Serbia. 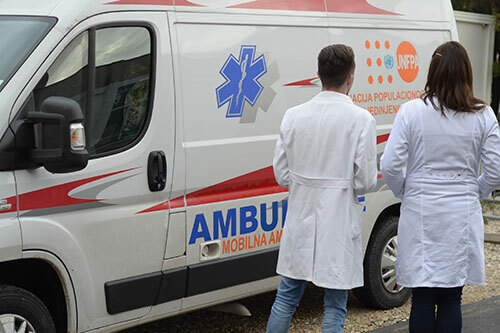 UNFPA has provided mobile clinics to the health centres in Sid and Vranie, which are reaching communities in Adasevci, Principovac, Presevo and Bujanovac. This care is not only for pregnant women. Services can also help people delay or avoid pregnancy, protect against sexually transmitted infections (STIs), and screen for reproductive cancers. But at the workshop, women revealed vastly different opinions about the importance of seeking these services. Many were uncomfortable even discussing the topic. And some were especially reluctant to seek health care when the services are provided by male health workers. They feared they would become the subject of rumours or stigma if they saw male gynaecologists. But Aliah says she has no such fear, and that her family supports her. “I have the full support of my husband, who agrees that we need to do everything for my own health and health needs of my child,” she said. Reha*, too, is willing to seek care. Like Aliah, Reha is from Afghanistan, and is pleased to know that reproductive health services are available in Serbia. She has two children, and would like to have more, but she suffers from a hormone imbalance that could affect her chances of getting pregnant again. Medical care could help remedy her condition, she said. But many women choose to seek health services only when they are pregnant, forgoing routine check-ups, STI screenings and counselling about family planning options. Even Aliah said she has only used contraceptives – in the form of condoms – for two months in her life. But she says she is open to the idea. Workshop staff emphasized that women should prioritize their own health, even when they are not pregnant. Meanwhile, Aliah is eager for her antenatal visit. “I just have scheduled an appointment for next week,” she said.